Imagine having to travel up and down Europe in the 16th century. It doesn’t sound very enticing, don’t you think? Carlos goes all the way up to Germany (which takes months) and then all the way again west to England. And with letters that get lost in France. All I’m saying is, let’s be thankful for the inventions of the telephone and motorized transport. King François (who, of course, spends half of his time in bed) is still a bit mad at Carlos after losing the Empire. No, extremely mad, actually. It is because of this that he decides to sign a peace treaty with Henry VIII. 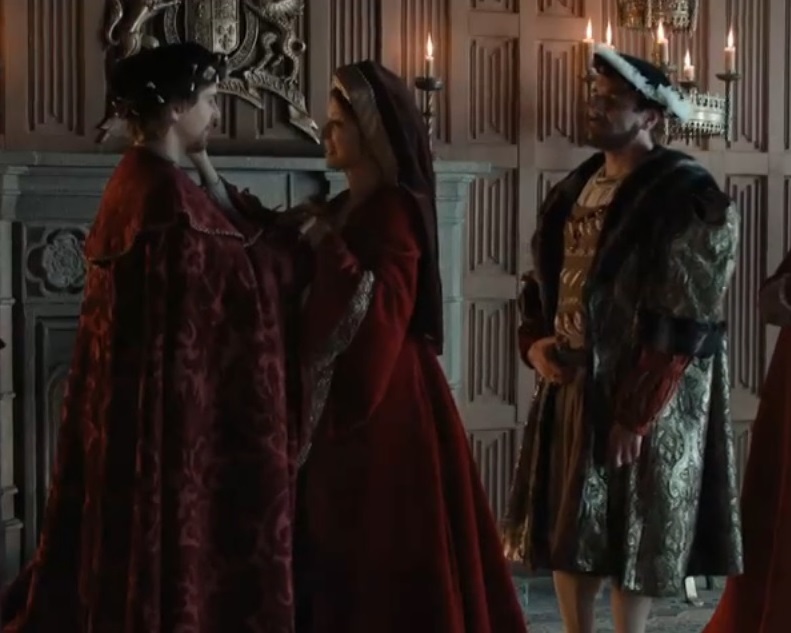 Of course, all he needs to get the English monarch and his wife Catalina to go to France is to give lots of money to Wolsey (nobody likes Wolsey). 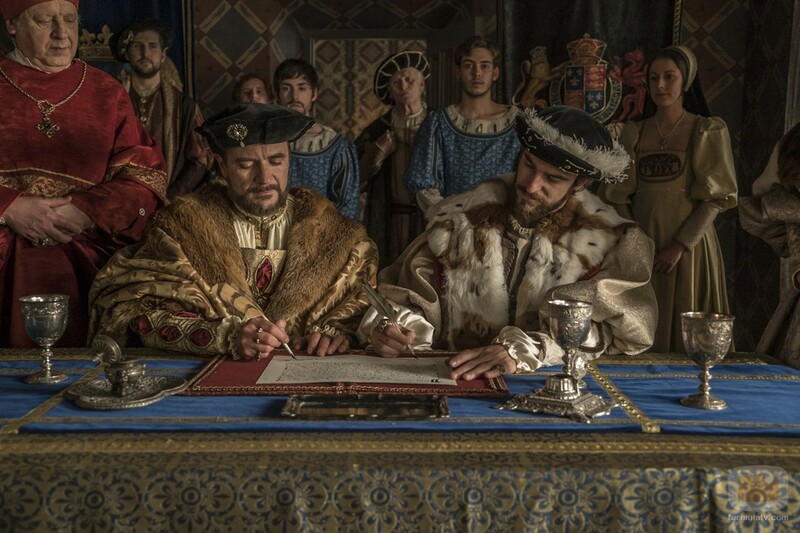 When Carlos’s aunt and uncle finally get to France, Henry signs the peace treaty, in which it is established that his daughter, Mary Tudor, will marry the French dauphin. Problem is that, during a cheerful feast, the kings decide to fight for sport, and as you can imagine, two kings as full of themselves as these two, if one loses, the other one is going to be ravishing mad. And that is exactly what happens: Henry loses and he gets angry as hell. But the marriage agreement is still on. Oops. Later on, François is not very happy when he finds out that the Empire-stealing Carlos has visited England and ruined the treaty. But, oh, François has a plan! Don’t be too surprised, but the plan is to go to war. Of course. The problem in Spain is that Carlos leaves for Germany too soon, even though there are revolts taking place precisely because the people don’t want him to leave. It is 1520 and the king is going to leave for his coronation and will spend three years out of the country, leaving Utrecht as the regent. That is a lot of time, time that the People’s Front of Judea decide to use to their advantage. Their plan? Go to Tordesillas to liberate Queen Juana and pretty much use her as a puppet to get rid of Carlos. It makes you feel incredibly sorry for Juana, but she is not stupid and acknowledges that, even though she knows her father and her husband used her, she won’t let the rebels use her too, and above all, she won’t betray her own son. This is something that doesn’t bode well with 15-year-old Catalina. The child has spent her entire life locked up in Tordesillas with her mother and this was her chance to break free. Don’t worry Catalina, you will be queen of Portugal one day. Small note: did you see that, in the courtyard scene, Juana was covering her head the same way her mother, Queen Isabel, used to? Carlos and his angrier-by-the-day hair don’t get a moment’s rest, not ever. He leaves Spain in a turbulent state and, as he gets to Flanders, he reunites with his aunt and his brother. Things don’t get off to a good start because Carlos is still mad at Fernando for running for emperor, but luckily, Margarita makes him see that he cannot just surround himself with flatterers, as that would make him a tyrant. So Carlos decides to be clever and make amends with Fernando, who explains that he is bored as hell: he was raised by King Fernando, let’s not forget that, so as he says, he was born to do politics and work strategies. Good thing that Carlos cares for his family and ends up giving up one of his titles to give it to his brother: Archduke of Austria. But things don’t end there. After what was a visually beautiful coronation scene, the main problem for Carlos is the French-English treaty that has just taken place. Desperate to do something about it, he asks for support from the Vatican, but the Pope is clear about it: he will help him only if Carlos arrests Luther. But arresting Luther would make most Germans angry, see the problem there? He just can’t get a break, and we all know the problem won’t end there. Although I must admit that I have always found that burning the sacred texts of any religion, even if it’s not your own and you don’t agree with it, is a very disrespectful thing to do. Also, Luther here has a very smug face, which made me dislike him the moment I saw him. It seemed, throughout the entire episode, that the English monarchs were being wooed by every country in Europe. Luckily, Catalina is a smart woman, so when Carlos writes to them to meet, she strongly supports her nephew. 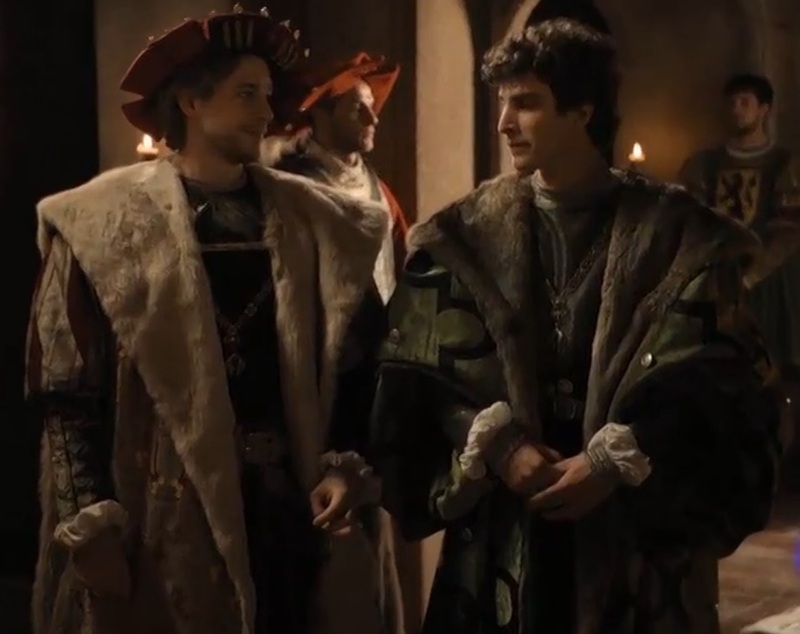 But Henry is a headstrong man and decides to meet the French king anyway (encouraged by Wolsey, of course). But as we know, the trip to France leaves Henry quite angered, a situation Catalina takes advantage of by informing Carlos about it. And when Carlos visits England, his uncle gives him an option: the only way he could annul the treaty would be to find his daughter another husband, and since Carlos doesn’t have kids, the only choice would be Carlos himself. Carlos at first is not convinced by this: his cousin is only four years old, it would be ages until they got married! But he eventually agrees. Thank God he had kids in the end. On the other side of the Atlantic, it was all drama –and murder! Hernán Cortés continued his immersion into the Aztec Empire by sweet-talking Moctezuma. That was his plan: make him your friend, then colonise while keeping their traditions and such. 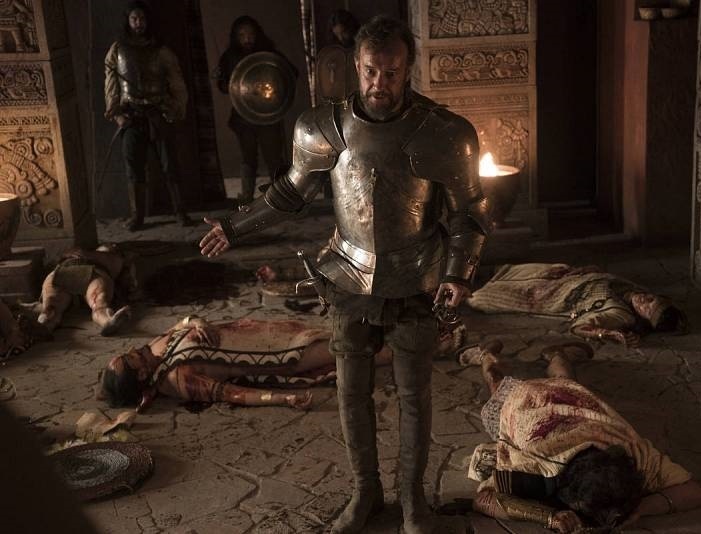 By the way, I must say it felt strange at first to see the Aztecs speaking Spanish, but it is a smart and necessary move: imagine if every single scene had to involve a translator in between. It would be endless and tedious. But of course, whenever the peace pipe shows up, there is going to be war, mutilations, murders and whatnot. The first conflict happens when some of Cortés’s men are killed by Aztecs who disobeyed Moctezuma’s orders of keeping peace (the emperor did want to attack the Spanish, but later on, when he had everything planned). To keep this from getting worse, Cortés decides to keep Moctezuma chained for a few days, so that his men don’t get bloodthirsty and start killing Mexicans around. But of course, this angers the natives, who now see Moctezuma as a traitor and a Spanish sympathiser. Poor emperor: he then gets brutally killed by his own, a la Julius Caesar, but at least Hernán Cortés seems to be truly devastated by this: he wanted to preserve the Aztec culture, and now everything is on fire. Sad face. A few days ago, the show’s scriptwriter Laura Sarmiento published a novel based on the show. The book launch was attended by actors from the show like Álvaro Cervantes (Carlos), Alfonso Bassave (François) and Victor Clavijo (Francisco de Borja, yet to make his first appearance on the show). You can see and read all about it here. I’m glad you are doing these reports as RTVE decided to deny access to those of us in America to watch the series after allowing four weeks of episodes. Malditos! All previous chapters that I watched are now off-limits. Sigh..If this happens with MdT, there will be trouble. Thanks but still can’t get it to work..Perhaps they’ve sold the rights already in the US? Luckily I found it online and oddly enough the RTVE website still has all the transcript. One thing that struck me was how the Aztecs all spoke Spanish without any interpreters. I have no problem with them speaking Spanish but figured it would be more realistic to at lease show an interpreter standing behind or between to indicate that they are translating. Overall another well done episode. I just wish Isabel of Portugal will appear soon! Don’t worry, Isabel of Portugal will start appearing regularly from episode 6! It was indeed a slow episode,but I think it was because this was the episode where everything that happened set things in motion for the rest of the series. I enjoy reading your thoughts on each episode, while I wait for the opportunity to see it myself. (My Spanish is not good enough to watch it in Spanish, so I must wait until some distributor subtitles it.) I can already see a few deviations from history in the series as per your assessment, but not enough to dissuade my excitement. Timely news item in the Guardian dealing with Cortes and Aztecs. Please @RTVE….. I can’t watch any more Carlos Rey emperador online…..! Is there a legal problem? please help!